I really need to tell more stories in French. I really, really do. In Quebec, there are just more opportunities to tell if I start telling in French and, if I play my cards right, I could become the Jim Corcoran of storytelling. 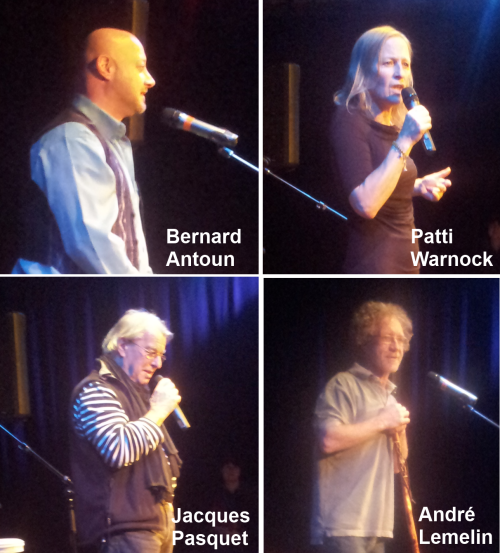 So a few months ago, André Lemelin asked me to take part in an evening of storytelling at the Maison de la culture de Villeray, Saint-Michel, Parc-Extension. It was a small crowd, but the stage was very nice. I was honored to share the stage with André Lemelin, Patti Warnock, Bernard Antoun, and Jacques Pasquet. Unfortunately, the show was not being recorded. But at the last minute, I decided to try the recording app on my phone so I would at least have a record of it. It turns out, the recording quality wasn’t so bad! When I rehearsed this story, I had it all down perfectly. But of course, the presence of an audience and a microphone challenged my composure, so my telling isn’t as smooth as I would have liked it to me. I really need more practice telling in French, and I need to slow my pacing down so I can mentally prepare to say each sentence properly so I don’t auto-correct so much. Practice, practice: that’s how you get to Carnegie Hall. So with just a bit of editing for sound quality, here’s the recording from that night.